Photo credit: Heritage J. Nature, 2004. Also, what's sauce for the goose is not always sauce for the gander! One person may do just fine eating corn, nuts, eggs, etc... but another may have terrible allergies. An allergy denotes an abnormal reaction by our immune system to bodily contact with foreign substances that would normally be harmless. There are said to be four types of allergic response. Type I, which causes immediate reactions such as restricted breathing, asthma, anaphylactic shock is the most well known, but effects a minority of the population. 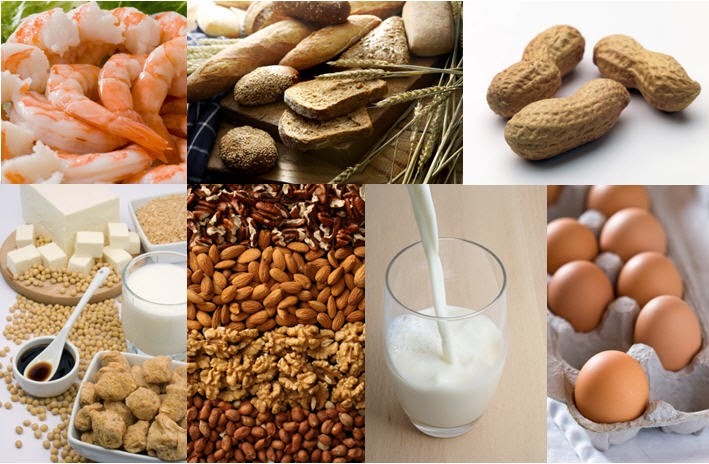 Leaky gut and food allergies often co-exist, food allergies or hypersensitivities can increase intestinal permeability, causing an immune response and provoking further inflammatory reactions throughout the body. When someone initially comes into contact with an allergen, B lymphocytes (a type of white blood cell) produce antibodies to attack the perceived threat. There are five types of antibodies called immunoglobulins. IgG, IgM, IgA and IgD protect us by attaching to foreign particles making it easier for other immune cells to destroy them. IgE antibodies are responsible for allergic reactions. Everybody has IgE antibodies but an allergic person produces high levels of IgE antibodies to attack the allergens. The IgE antibodies bind to mast cells (resident cells of connective tissues containing allergy mediators) and basophils (a type of white blood cell containing allergy mediators) located in human tissue. The next time the person comes into contact with the allergen the mast cells and basophils will release potent chemical mediators such as histamine causing an allergic reaction. Typical allergic responses are: runny nose, itchy eyes, wheezing diarrhoea, swelling, vomiting, restricted airways, eczema, hives. Type I allergies can also cause anaphylaxis and even death. The most common substances to cause Type I allergies are: medicines, dog and cat fur, dust mites, mould, pollen, bee stings, but other substances can also cause reactions such as: certain fruits, perfumes, smoke, nuts and other food or environmental substances. Without boring you to death, please, please take into account any allergies you may have to the foods you eat! This is one of those things you will need to seek a doctor's advice on if you think you may have an allergy--don't spin your wheels, get tested! The fear of genetically modified organisms in our food supply may be media driven, and it may also be impossible to avoid, but I think there is enough evidence that someone with a really bad gut should seek out ways to avoid GMO foods. It's not that hard when it comes to grains...corn, soy, and wheat are nearly all to be suspected of being a GMO--so don't eat them! Other things like sugar, rice, and potatoes may also be grown from GMO seed and it is almost impossible to know when buying them. “Horizontal Gene Transfer. Does horizontal gene transfer (HGT) between DNA from consumed GMO corn and corn products to our gut microbiota occur? Another emphatic YES. 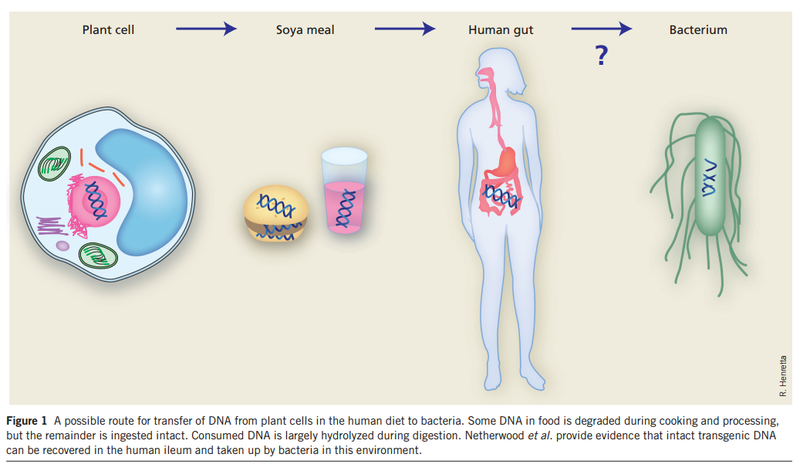 How do you reverse it if your microbiota is transformed? 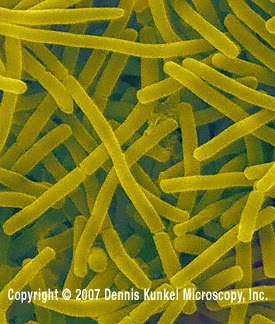 I wish I knew... Bacteria and fungi live in biofilms and exchange DNA within the matrix. Like a meme gone viral. Evidence for both DNA and lectin proteins from GMO Bt corn has been found in animals and humans that consume Bt corn. The DNA was found to survive and persist for a long time in the gut/rumen. Every pesticide corporation has a GMO Bt corn brand. Bt is a lectin (like gluten) and disrupts intestinal epithelium in susceptible victims which can lead to gut dysbiosis and/or death. It was very effective pesticide in the beginning. “Recently pesticides from Bt GMO crops were found in 80% of fetuses and 93% of adults (healthy pregnant) randomly tested in one Canadian study (Aris and Leblanc, Reproductive Toxicology, 2011). This herbicide is used as a topical spray as well genetically spliced into the DNA of GMO crops with promoters for high-copy amplification and expression of of a bacterial toxin bacillus thuringiensis (Bt). Bt toxin is also known as Cry1Ab protein. It is a gut specific delta-endotoxin which exerts toxicity through increasing larvae/insect intestinal permeability causing the death of crop pests like leaf- and needle-feeding caterpillars (lepidopteran insects --butterflies, moths), beetles (coleoptera--weevils, ladybugs, beetles), and the larvae (e.g. babies) of leaf-beetles. It has been designed to be toxic to mosquitoes (dipteran)now. Fun, no? 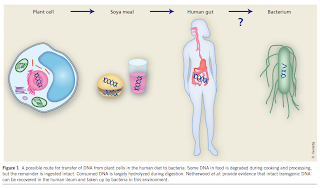 Has lateral transfer of Bt DNA to our gut bacteria and microbial communities already occurred (or at least the unborn and adult Canadians in Aris and Leblanc's study)? Are we transformed? Mutant gut-hybrids of GMO experiments gone awry? “In 1998 two scientists fed mice for two weeks potatoes (a) soaked for 30min in a dilute suspension of harvested Bt toxin (from bacterial spores grown in the lab; 1 g/L concentration), (b) transgenic Bt potatoes, and (c) control potatoes. Mild structural changes in the microvilli of the ileum of the transgenic GMO Bt potatoes were seen in. 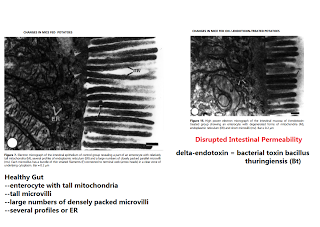 However in the Bt delta-endotoxin soaked potato-fed mice, the ileum changes were quite substantially greater in scale -- '...basal lamina along the base of the enterocytes was damaged at several foci. Several disrupted microvilli appeared in association with variable-shaped cytoplasmic fragments.' The authors further report 'in the group of mice fed on the delta -endotoxin-treated potatoes, the Paneth cells of the crypts of Lieberku¨hn were highly activated and contained a large number of secretory granules. These cells are believed to have an important role in the activation of phagocytes and controlling the bacterial ﬂora of the gut (Ariza et al., 1996; Fawcett, 1997). They contain elevated levels of lysozyme in their large eosinophilic secretory granules, an enzyme capable of digesting bacterial cells walls, and antibacterial peptides called cryptdins (Junqueira et al., 1998). Ouellette (1997) revealed that Paneth cell secretory products seem to contribute both to innate immunity of the crypt lumen and to deﬁning the apical environment of neighboring cells....The antimicrobial polypeptides of the Paneth cell secretory products kill a wide range of organisms, including bacteria, fungi, viruses and tumor cells (Aley et al., 1995).' Lysozymes are 'cutters' -- they cleave and cut things, for instance, tumour/cancer cells and cell walls of pathogens that take a ride in our food. Damage to the ileum and small intestines can lead to changes in microbial population and the disorder known as SIBO (small intestinal bowel overgrowth). An expanding body of knowledge links SIBO with nearly every chronic systemic and skin disease seen in outpatient medicine. Do dietary lectins cause disease? 1. Fermented veggies made the ancient way with organic dirt-covered vegetables, ex. kraut, kvass, kim chee, kefir, etc. Read Sandor Katz. Now, where have we heard that before. Sounds a lot like the Primal Blueprint! If anyone here doesn't know who Mark Sisson and Grok are, now is the time to meet them. Mark Sisson came up with his Primal Blueprint as a way for the average person to implement a paleo diet in a personalized way that works for anyone from beginner to elite athlete. One of the first things you will learn when you start reading the Primal Blueprint is that you don't need to kill yourself running mile after mile. Walking steadily at a slow pace is the much preferred route to health and happiness. Grace says to walk 10,000 steps and then recommends you do it in an hour . . . hmmmmm. I think her pedometer was broken that day or she was buzzing on lattes, because 10,000 steps is 5 miles by most accounts! But that's OK, we'll give her that one! The takeaway is that you need to get up and get moving. Walk as much as you can. Don't have an hour to spare, take four 15 minute walks, three 20 minute walks, heck--take 10 six-minute walks! Just get walking. Walking is a great way to keep your intestines limber and healthy. If you have a sedentary desk job, it's even more important that you get up during the day and WALK. Tell your boss you took up smoking, then follow the smokers to the smoke shack and do laps around the parking lot while they shorten their lives. According to this article, "As far back as the late 1950s, a study found that people with sedentary jobs (bus drivers) were twice as likely as those with active jobs (mailmen) to develop cardiovascular disease. More recently, extended daily TV watching and time on the computer-which, like desk jobs, involve long periods of time sitting still-have been linked to a greater risk of metabolic syndrome, a constellation of health problems that can lead to diabetes and heart disease." Here is a great website for all things walking related if you need some motivation to get started, but seriously, just walk. Get some comfortable shoes and walk. If you are a busy mom chasing kids or a factory worker who is on your feet all day, you probably have the walking part covered, but still, a nice leisurely stroll can be very relaxing and a great way to get outside. There are two main ways that food and mucus material in the small intestines move along the gut (1) peristalsis and (2) MMC, myenteric migrating complex. Peristalsis is the weak, wiggly movement propagated by the smooth muscle lining the intestinal tract. 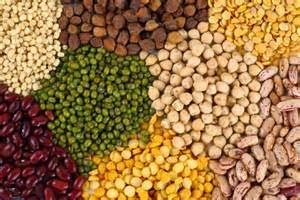 The myenteric migrating complex on the other hand is powerful and strong, starting from the stomach and vibrating like a heart beat or pacemaker through the small intestines in pulses throughout the day every 90 to 120 minutes. These are known as 'housekeeping waves'. It is also described as 'a band of neural excitation that travels slowly across the stomach and intestines.' The movement quickly shuttles along the contents, mucous, bacteria and fungi out of the small intestines to the large intestines when we are fasting and through out the day. Usually the MMC rhythmic contractions are painless and unnoticed, but for those with IBS or other bowel inflammation, sometimes these are uncomfortable or painful. The presence of food actually temporarily decreases the MMC propulsive action because the gut needs to slow down for food to be thoroughly digested and absorbed in the small intestine, no? So it is no wonder that high-bolus insulin doses (which mimic eating) will stop the MMC. Guess what subgroup has poor functioning guts, SIBO and MMC? Type 2 diabetes and obese individuals where the MMC is less functional secondary to high insulin levels. Additionally when the BG (blood glucoses) have been pathologically elevated for decades, damage to the nerves that regulate the small intestines can happen and this is known as autonomic neuropathy. The result is abnormal peristalsis, spontaneous contractions, and reduced tightness of the sphincters which grip and prevent intestinal contents from escaping to places they shouldn't (like backward in heartburn/stomach contents or with feces). Part of the charm of exercise is that all of these gut motility issues can be improved or even reversed with routine, regular exercise which improves insulin sensitivity, strengthens smooth muscle, improves the pacemakers of all of organs and calms the nervous system that regulates every organ. Did you know our small intestines are innervated by 100 million neurons, as many as the spinal cord (Gershon 'The Second Brain')? Therefore innervations to the small intestines can become 'broken' from various conditions which will lead to higher degrees of small intestinal bacterial/fungal overgrowth (aka SIBO/SIFO -- hat tip Keith Bell). Additionally hormone changes and structural tissue damage may also 'break' the sweeping motions that naturally occur in the small intestines leading to pseudoobstructions and SIBO (see HERE for complete list including hypothyroidism, diabetes, autoimmune diseases (celiac), viral damage (CMV, Epstein Barr, herpes zoster), drugs (verapamil, diltiazem)). Exercise may not entirely erase damage to our second brain in the our guts but it can potently improve inflammation at the intestinal level and condition and strengthen the smooth muscle that control the contractions of the gut (peristalsis, MMC). When I had CFS (Chronic Fatigue Syndrome) and nearly bed-bound, I couldn't walk a block, let alone 5 miles. If you haven't the capability to walk or jog far, start low and go slow. Consider starting with hydrotherapy or swimming (no gravity) gently at first for only 10 minutes daily and gradually build to tolerance. Gut microbiota composition in male rat models under different nutritional status and physical activity and its association with serum leptin and ghrelin levels. PLoS One. 2013 May 28;8(5):e65465. Habitual exercise program protects murine intestinal, skeletal, and cardiac muscles against aging. Rosa EF, Silva AC, Ihara SS, Mora OA, Aboulafia J, Nouailhetas VL. J Appl Physiol (1985). 2005 Oct;99(4):1569-75. Freewheel training decreases pro- and increases anti-inflammatory cytokine expression in mouse intestinal lymphocytes. Hoffman-Goetz L, Pervaiz N, Packer N, Guan J. Brain Behav Immun. 2010 Oct;24(7):1105-15. 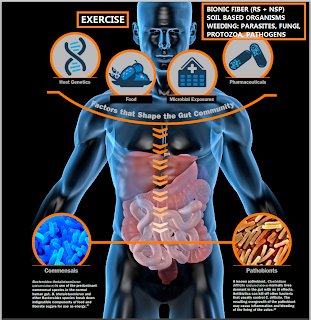 Exercise attenuates PCB-induced changes in the mouse gut microbiome. Choi JJ, Eum SY, Rampersaud E, Daunert S, Abreu MT, Toborek M.
Environ Health Perspect. 2013 Jun;121(6):725-30. Reflux oesophagitis in adult coeliac disease: beneficial effect of a gluten free diet. Cuomo A, Romano M, Rocco A, Budillon G, Del Vecchio Blanco C, Nardone G.
Small intestinal bacterial overgrowth: a comprehensive review. Dukowicz AC, Lacy BE, Levine GM. Gastroenterol Hepatol (N Y). 2007 Feb;3(2):112-22. Gut peristalsis is governed by a multitude of cooperating mechanisms. Am J Physiol Gastrointest Liver Physiol. 2009 Jan;296(1):G1-8. Chronic intestinal pseudo-obstruction: assessment and management. Connor FL, Di Lorenzo C.
Gastroenterology. 2006 Feb;130(2 Suppl 1):S29-36. 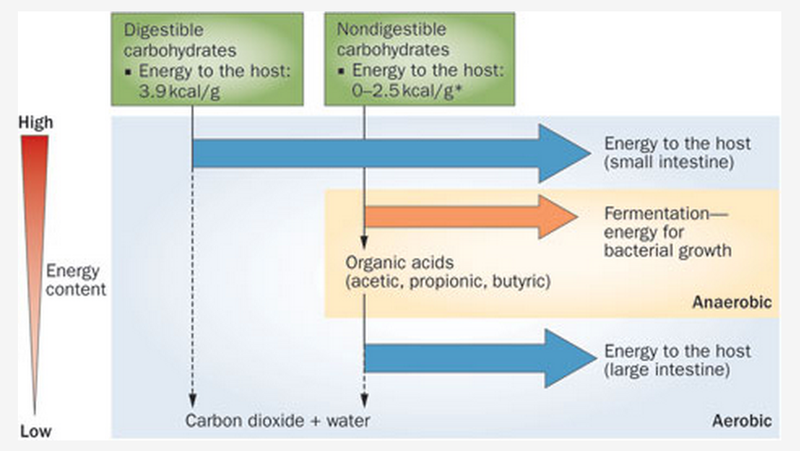 Credit: Harry Flint et al, Nature, 2012. The best, ancestral resistant starch for long-term health, leanness and modern, disruptive lifestyles is RS3, cooked-cooled resistant starch. The crystals that form upon cooling make up a dense, DNA-like configuration that our gut flora love; they have adored and have specialized preference for RS3 for millions of years since our hominid ancestors discovered FIRE. In epidemiological studies, RS3 in ancestrally prepared food protects against diabetes, inflammation, diseases of aging and colorectal cancer. Or eat soil-based organisms (SBOs) from ancestrally prepared fermented foods: KOREAN PEPPER PASTE (GOCHUJANG), Thai shrimp paste, natto, fermented black beans, etc. 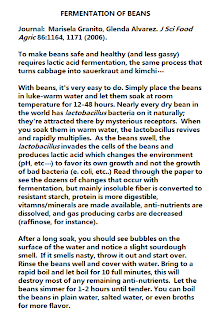 Today we'd like to talk about step 3 in Dr. BG's 7-Steps Paleo* Gastro IQ SIBO Protocol. I came here as a bit of a know-it-all on resistant starch [RS3 from legumes, lentils, whole GF grains and roasted heirloom tubers/roots], but quickly realized that while RS3 was somewhat of a missing-link on a paleo diet, soil-based organisms (SBOs) are missing even more-so. Luckily, combining RS and SBOs is the quickest route to restoring harmony in the gut. In a few email exchanges with Dr. BG, she mentioned SBOs several times. I was totally unfamiliar with the term. I thought to myself, 'wow--she is so dumb, she can't even spell 'SIBO'. Boy was I in for a surprise! After sending me 200 links to read, I quickly became a believer in Soil Based Organisms. Also known as Homeostatic Soil Organisms (HSOs), these microbes have been flying under the radar for decades. All throughout our evolutionary history, SBOs were there with us. When we started cleverly sanitizing our hands, sterilizing our eating utensils, and homogenizing everything we ate SBOs were no longer our faithful ally. Soil Based Organisms are microbes which normally live in dirt, but can also live happily in our digestive tract. Approximately 30 different strains have been successfully isolated and are commonly put into probiotic supplements. There are hundreds of articles available concerning SBOs, but most of them are advertisements from the supplement industry designed to sell you their favorite formulations. I managed to find a few papers that were reviewed by the National Institute of Health such as this one on SBOs and Immune Function. The article describes using SBOs to successfully treat Chronic Fatigue System and cancers and they had "...proven successful in restarting the immune systems of persons with allergies, lung cancer and TB." A clinical study was done with 25 sufferers of IBS using a commercial SBO probiotic. The study concluded: " This study identified 3 subsyndromic factors of IBS: general ill feelings/nausea, indigestion/flatulence, and colitis. In this methodologically oriented double-blind study in patients with IBS, combined probiotic-prebiotic treatment with Prescript-Assist was associated with significant reductions in these factors." I looked at the formulations of several SBO supplements recommended by Dr. BG and found they all contained a variety of microbes. The first one I looked at is called Probiotic-3 from iHerb. 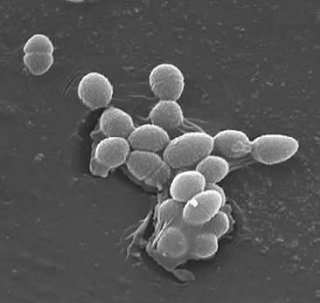 It contains Streptococcus faecalis, Clostridium butyricum, and Bacillus mesentericus. Each one of these are well known probiotics found in the soil and in humans and convey protective properties when in the human digestive tract. Bifidobacteria and Lactobacillus are some of our most ancient enviromental and soil based microflora that our ancestors co-evolved with. If anyone is as interested in gut microbes as Dr. BG and I, please click each link above...these are links that I personally searched for, they were not hand-fed to me by manufacturer. For instance, the link on Lactobacillus paracasei will lead you to an article by the American Society for Microbiology concerning this microbe and it's relationship to mucosal immune response. I will leave it to you to look into these, as each one alone could fill several blogs! Here is the takeaway for this blog: If you are severely immune-compromised, do not take any probiotics. They are alive or spores (except for the killed ones). Like a live (attenuated) vaccine, probiotics are contraindicated in a severely immune-compromised individual, someone on or after chemo/radiation, low WBC or suppressed bone marrow. 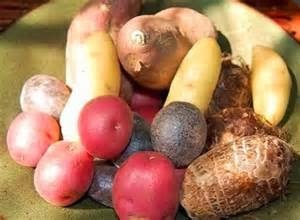 "Ancient heirloom potatoes, tubers, roots that are low glycemic index (or high if good insulin sensitivity) and ancient heirloom grains, legumes, lentils/dal that are low glycemic index (or high if good insulin sensitivity), prepared the ancient way (soaked, fermented, etc)"
Potatoes, tubers, roots, grains, legumes, and lentils have been alongside man throughout our evolutionary past. Eating these foods is very important in keeping our gut microflora in top-notch condition. You saw in the Fat Burning Beast blogpost that a digestive system starved of carbohydrates, fermentable fiber, and butyrate leads to a high risk of colon cancer, but it also leads to a dysfunctional and less prolific gut microbiome. The Standard Western Diet leads to a Standard Western Microbiome, one that has been starved of healthy, fermentable fibers, flooded with antibiotics, and allowed to proliferate with pathogenic bacteria. This leads to inflammation, metabolic syndrome, and auto-immunity. On the other hand, A paleo diet, with near complete avoidance of refined sugars, flours, gluten, and vegetable oils and plenty of starchy, fibrous plant matter will produce a functional microbiome, replete with beneficial bacteria, flooded with short-chain fatty acids, and ensure immune system homeostasis, glucose regulation, vitamin and mineral uptake, and production of vital hormones and neurotransmitters. Often times when starting a paleo diet, one restricts carbs. This is an effective strategy for weight loss and may help eliminate unhealthy sugar cravings, but in the long run carb restriction will most certainly lead to a dysfunctional gut microbiome. Both the Perfect Health Diet or Mark's Daily Apple Diet outline the optimal amount of starch that one should include in their diet. A daily food intake that is roughly half plant matter, including up to one pound of starchy foods is highly recommended. [Grace~~ Dispelling fairy tales: I love Paul and Mark. (Particularly Mark's pectorals and gluteals and how he recognizes a good thing like RESISTANT STARCH for the gut microbiota and insulin metabolism) We have all evolved but I'm not certain if their respective diets entirely have. What I like about PHD is the 150 grams per day advice for adrenal dysregulation because ketosis/VLC will instigate susceptible adrenals into hypercortisolism, and subsequent low adrenal and low T3 thyroid syndromes. PHD can heal this. However, the reliance on white rice and not the whole grains, whole legumes and RS-rich tubers will lead to gut dysbiosis for those who are vulnerable. Adding these back in are thus imperative. If I consumed 150 grams of high GI (glycemic index) white rice daily, I'd be T2DM within two seconds. But if I consumed 150-200 grams of low glycemic index carbohydrates that included RS-rich starches, grains, and tubers, ME AND MY MICROBIOTA ARE GOLD *wink wink*. And the net carbs are 75-100 grams/day. If 'carb restriction' means eliminating gluten, industrially processed flour, and refined sugars, that is perfect! If it means eliminating potatoes, rice, and most other whole, starchy foods that's a problem. The purpose of this blog is to teach you how to chose and prepare starchy, fibrous food in a way that will lead to a high Paleo* Gastro IQ. The list goes on and on, but you get the picture--no need to rely only on potatoes and rice! Each different variety packs a different punch. Beans and lentils are often frowned upon in paleo circles, but when properly prepared, they are one of the most nutritious foods on the planet. 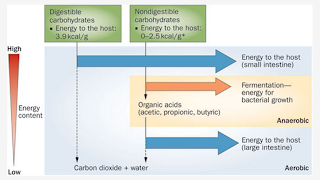 When it comes to grains and legumes, one of the biggest problems is phytates. An exceptional write-up on phytates and how to remove them can be found here. "...phytic acid does indeed bind with minerals such as calcium, phosphorus, iron and zinc. 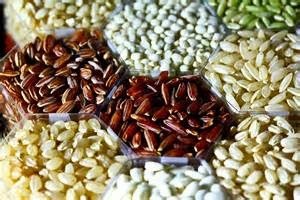 If you depend on grains and legumes for a high portion of your diet, then those phytates (phytic acid) could lead to mineral deficiences." Fortunately our ancestors found ways to remove phytates and these methods can be used today to make these evolutionary important foods safe. 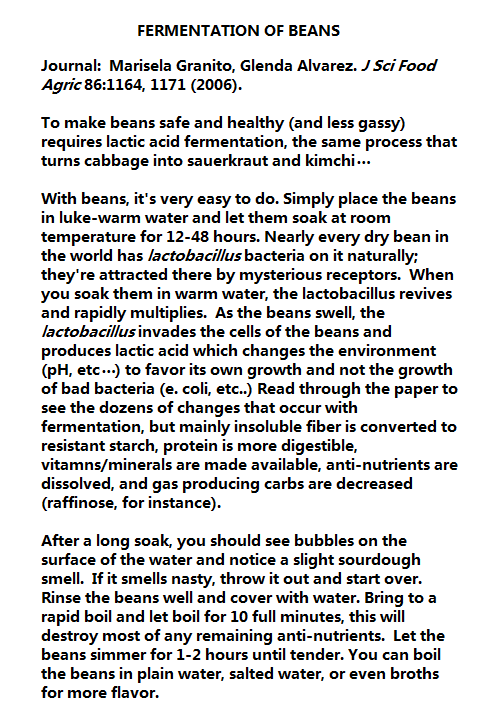 It would be of great benefit for you to learn the techniques of sprouting and fermenting to increase your range of healthy foods. "Personally I believe gluten-free is not enough for an ultimately optimal lifespan and health. Gluten-free products often still are refined, vastly processed and full of high carbohydrates and problem oils (oxidized, pesticide-laden crops of omega-6 canola, safflower, cottonseed, etc) which spike and increase blood glucoses (BG) and promote silent inflammation. Chronic silent inflammation leads to cancer, obesity, fibromyalgia, mood disorders, arithritis, weight gain, osteoporosis, diabetes, heart attacks and strokes. Gluten free however alone improves stomach and GI symptoms including bloating, constipation, bloody stools, iron deficiency anemia, chronic fatigue, IBS (irritable bowel syndrome), and gut dysbiosis." The best advice we can give you is to include plenty of starchy carbs in your daily menu planning and learn to broaden your horizon. The more variety in your diet, the better profile your gut microbiome will develop. If you have any questions or concerns about our food list or want to see any added, please comment!